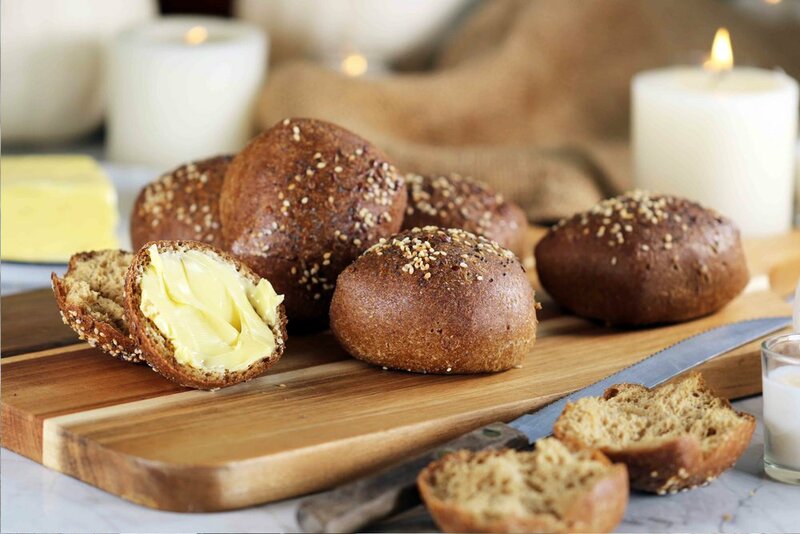 These are probably the closest thing to real bread as you can get without the carbs, for me these are an absolute game changer, because they have the texture and taste of a whole grain roll. They toast up nicely, are fantastic for sandwiches, lunchboxes anything where you would usually use bread. Unlike other almond flour-based breads, you can’t detect the taste of almonds in this bread at all and they are incredibly light and fluffy. The magical ingredient here is something call psyllium husk, it’s a fibrous powder that soaks up a lot of water and provides a gelling and binding agent, similar in a way that wheat gluten does. The psyllium husk gets darker as it cooks, giving these rolls their wholegrain taste and appearance. The rolls are 2 grams net carbs each, and the dough could be shaped anyway, so you could make bagels, burger buns, whatever you like, however I have found cooking this recipe in a loaf results in a dense bread because of the weight of the almond flour, so whatever shape you make them, I’d recommend smaller rolls, biscuits, buns or bagels which remain light, fluffy and well risen. 1. Preheat the oven to 350F/180C. 2. Sift the almond flour, psyllium husk powder, vital wheat gluten (if using), baking powder and salt into a mixing bowl. 3. In a separate bowl mix half a cup (120 ml) warm water with the dried yeast, whisk well and leave in a warm place for the yeast to activate. 4. add the egg whites to the flour mixture and beat until well combined, pour in the 1 ½ cups of boiling water and mix well, the psyllium husk will soak up the water and you’ll have a nice soft dough, there is no need to knead this dough like regular bread, and it is better if you don’t over mix. Leave the dough to cool for about 5 to 10 minutes until just warm. 5. Once the dough has cooled from the addition of the boiling water add the yeast mixture, it’s important that the dough is warm and not hot, because if it’s hot it will kill and deactivate the yeast. Yeast likes the human body temperature range to work best, so aim for 37C/98F. Beat in the yeast mixture until all ingredients are combined and you have a nice soft dough. 6. Transfer the dough to a work surface dusted with almond flour, roll out into a rectangle shape and cut into three rows across and four rows down, cut each square in half diagonally so that you have 24 triangle shaped pieces of dough. At this point you can cut and shape the dough however you like, so have some fun! 7. Transfer the dough pieces to a baking tray lined with baking parchment and cover with plastic wrap, leave in a warm place (I like to put above the pre-heating oven) for 1 hour to rise. 8. After the rolls have risen, they should have doubled in size, remove the plastic wrap and gently brush each one with the beaten egg, then sprinkle over the topping ingredients which have been mixed together. 9. Place into the oven and bake for 50 minutes until well risen, golden brown and sound hallow when tapped. Cool on a wire rack.